In the metal industry whenever a band is even remotely successful there is enormous pressure to change to a more mainstream radio-friendly sound. In the metal community, this is generally referred to as “selling out”. Some bands do in fact give in, as was the case with All That Remains. Other bands, like As I Lay Dying, do the opposite, doubling down on aggressiveness and adopting an even harder, heavier sound (“The Powerless Rise”). 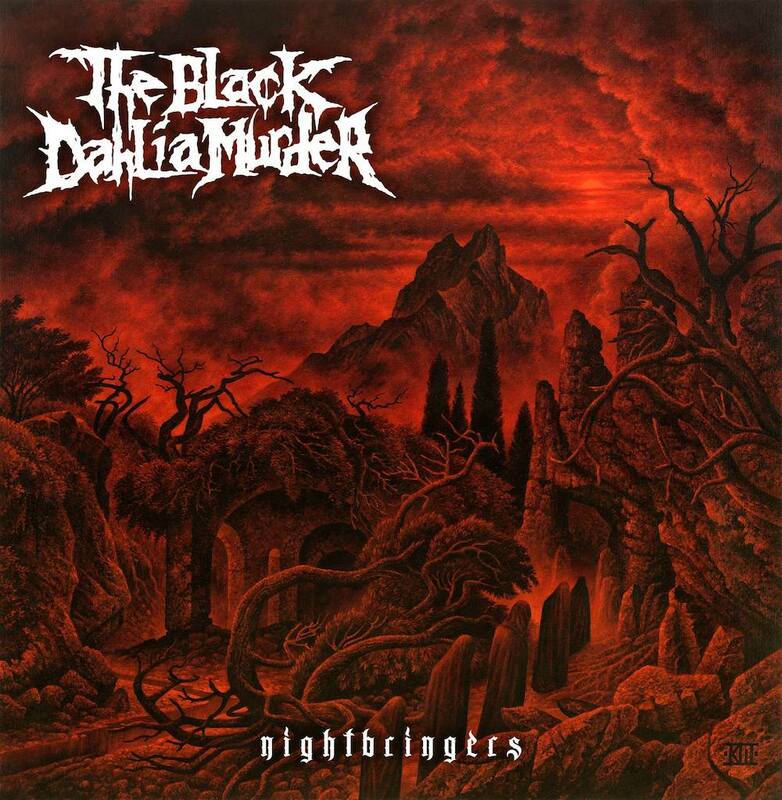 The Black Dahlia Murder, one of the best melodic death metal bands of recent years, received accusations of selling out back when they performed at the Vans Warped Tour. They responded in the most metal way imaginable, naming their very next album “Everblack” as a response to those claims and not softening their sound one idiota. The bands latest, “Nightbringers”, continues that trend, but with the addition of new lead guitarist Brandon Ellis, it sees the band refining their sound to new heights. The album opener, “Widowmaker“, begins with an electronic drum sound and sound effects to set the mood, which I wasn’t a big fan of, but once the guitars and full band kicked in I knew we were being treated with a great beginning up there with “Everything Went Black” off Nocturnal. Vocalist Trevor Strnad is known for creating characters in songs and this one seems to be about a hitman and it features standout lines like “You’d suggest I’m a cold-hearted man. Well it’s a cold-hearted world”. Next up we have “Of God and Serpent, of Serpent and Snake“, which is about Adam and Eve. I really like the first segment of this track because it pummels the listener with TBDM trademark style of melodic death metal and is relentless up until a small slowdown portion, before picking things back up again. My only complaint is the song starts to drag on a little towards the end. “Matriarch” (listen here) tells a grisly story of a woman who can’t get pregnant but desperately wants a child, so she stalks a pregnant woman, forces her to crash her car, then cuts her baby out of her womb with a knife, leaving the woman to die. It reminds me of the plotline to the amazing French horror film “Inside”. Strnad could easily be a novelist with how vividly his lyrics tell the story. It’s the little details, like “The smell of entrails wrestling the nose”, that help paint such a gruesome picture. Many of the lyrics expertly match the killer riffage, like the line, “my knife is drawn so deadly sharp”, heard over a shifting chord progression to give it a serrated feeling. The way the song ends with a reprise of a line introduced earlier in the song, “see that big ol’ God up there? Well he don’t see me” is one of the most black and cold moments on the album, conveying a sense of morbid finality and hopelessness in the realization that God isn’t going to do anything to stop this violent act. The lead single and title track “Nightbringers” (listen here) is one of the catchiest tunes and the most head bang worthy songs on the record. All around amazing with great riffs, awesome vocals, and a solid solo. The first song to give me downright chills, however, was “Kings of the Nightworld” (listen here) and I’d go so far as to call it the best metal track all year. The main motif heard from the get-go is impressively loaded with artificial harmonics. The dynamics of the song change around alot, with full band chants and rapid-fire delivery from Strnad. It’s a track that will have you throwing up the devil horns as you hear one amazing section, only for it to shift into another equally amazing one, over and over again. “Jars” and “As Good As Dead” are both really good tracks but kind of get overshadowed by some of the albums stronger moments. These two do well to showcase other aspects of the bands talent though. The drum work in Jars really caught my ears, and As Good As Dead had a memorable downward riff that could be heard on the last bar of the chorus. There’s not a clean vocal on the whole album, but Trever Strnad does break up the monotony of alternating shrieks and growls by matching his screams over some of the more melodic riffs, creating a false sense of melody that loses none of the abrasiveness. The introduction of new lead guitarist Brandon Ellis, who is younger than the rest of the band, injects fresh blood into the mix. Most of his riffs capture the dark gothic feel you’ve come to expect from Dahlia, but things seem more refined, with added structure, and just the right balance of gloomy melody. The solo work was pretty good too, nothing mind-blowing, but serviceable. I do have one complaint to level at the album and that is the vocal mix. To my ears, the vocals are a bit low, which is especially noticeable when playing in the car. This makes the amazing guitar playing stand out, but it takes something away from the full impact of the band, which is a shame, especially since it sounds like Trevor did such a great job creating interesting lyrical parts to go over the music. Also, the album only has 9 songs on the standard edition, which may disappoint some, but to be honest, I prefer brevity of this quality over filler. Nightbringers should more than please all metal fans and is a goto example of how awesome the genre can be in the right hands. 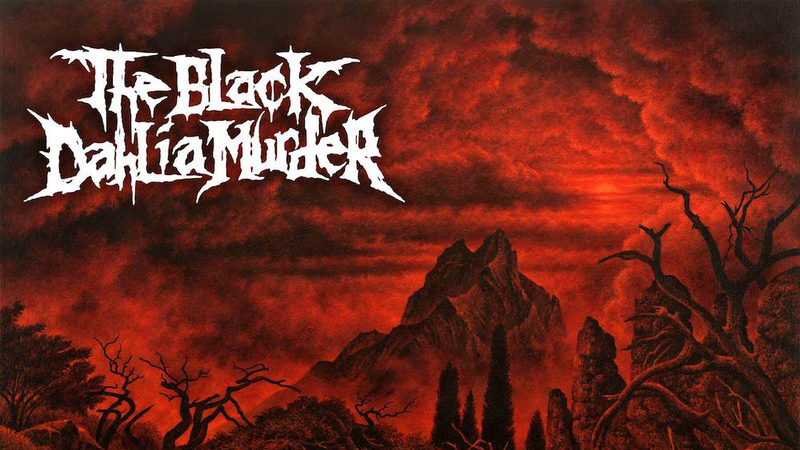 It’s undoubtedly TBDM’s best album to date, combining all the elements they’ve perfected over the years resulting in a well-crafted onslaught of dark shadowy evil. With its timely October release, it should be everyone’s official soundtrack for the 2017 Halloween season.